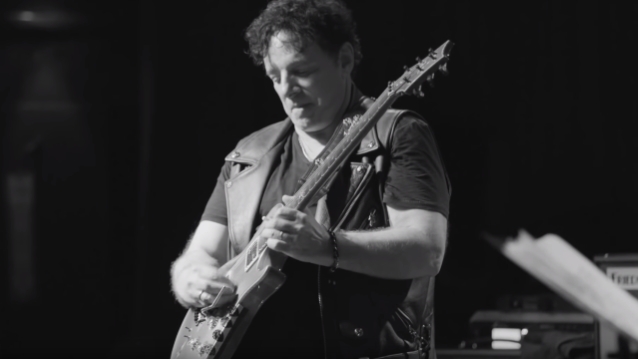 JOURNEY guitarist Neal Schon has added more dates to his "Journey Through Time" tour, which kicks off later this month. Schon will take the stage alongside founding JOURNEY and SANTANA singer/keyboardist Gregg Rolie, ex-JOURNEY drummer Deen Castronovo, bassist Marco Mendoza of THE DEAD DAISIES and THIN LIZZY, a musician named Chris Collins (on guitar and keyboards) and super-producer Marti Frederiksen (multi-instrumentalist, vocals). "Journey Through Time" will hit the road for the first time, celebrating JOURNEY's legendary catalog and rich history. Returning to their roots, the band will showcase songs from the very beginning — plus pay tribute to your favorite classic hits. "We're really going to play anything that's in our repertoire — anything that JOURNEY has recorded," says Schon. "I plan on mixing it up a lot and not playing the same set. Stuff from our first three records — we're going to update that a little bit — and have some fun jamming!" Explaining his decision to play shows away from JOURNEY, Schon wrote on his blog: "I was told by management [John Baruck] that we all would take all of 2019 off, except for possibly a few dates near the end of the year leading into 2020 and that Jonathan Cain [and] Steve Smith [had] other things they wanted to do. At that point, I decided to go out and have some fun with Gregg Rolie, Deen Castronovo, Marco Mendoza, Marti Frederiksen and Chris Collins and dip into our catalog — deep tracks (from the beginning and beyond)." He added: "That, my friends, is the way it REALLY went down instead of trying to blame me for [JOURNEY] not playing [this] year."